Toronto is a city undergoing massive transformation, a fact which is underscored with particular weight when one walks up its main artery. 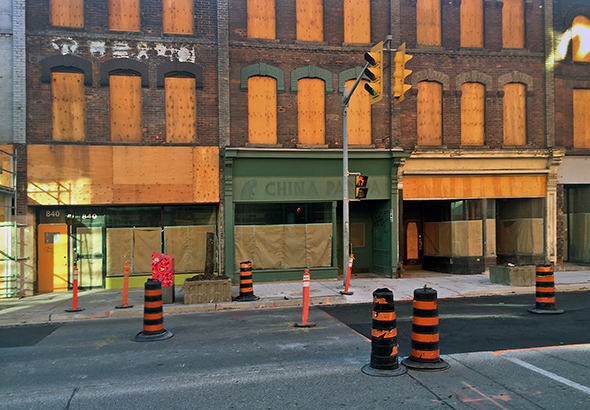 Long the heart of hodgepodge retail in Toronto, Yonge St. is in the midst of being reborn as the city's primary condo corridor. The process got underway a while ago with developments like Aura and One Bloor East, but the condo machine is working overdrive now with so many developments in the works that the previous character of the street will be forever changed. Perhaps it's already happened. 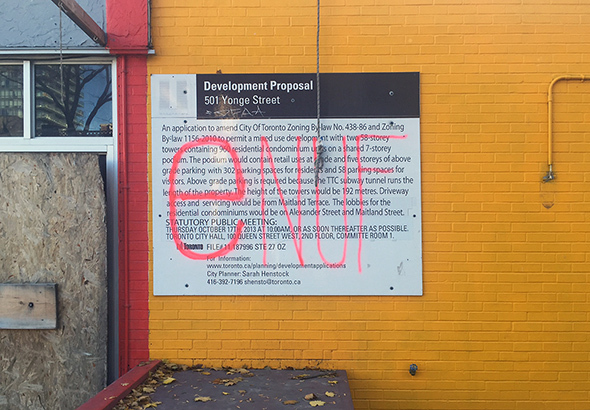 Walking north of College, one encounters two sprawling blocks of demolished and boarded up buildings. Further north at Bloor, a soon-to-be-finished skyscraper casts a shadow on a collection of heritage buildings boarded up and awaiting restoration before a new tower rises above them. One is tempted to say that Toronto looks like Detroit in these instances, but the comparison is unfair given that the hoarding is temporary. Soon, polished brick and lots of metal and glass will takeover. What you do have, however, is a last image of old Yonge St. The two storey block to be demolished at Yonge and Alexander, for instance, dates back to the late 1970s, when the street was at its grittiest glory. Let's channel Don Draper and say "change is neither good or bad -- it simply is." Getting too misty eyed about massive development on Yonge St. would be to ignore that fact that this is exactly where condos should be built in the city, right above our best served subway line. Nevertheless, one should note and perhaps mourn a certain version of Toronto that's in steep decline. 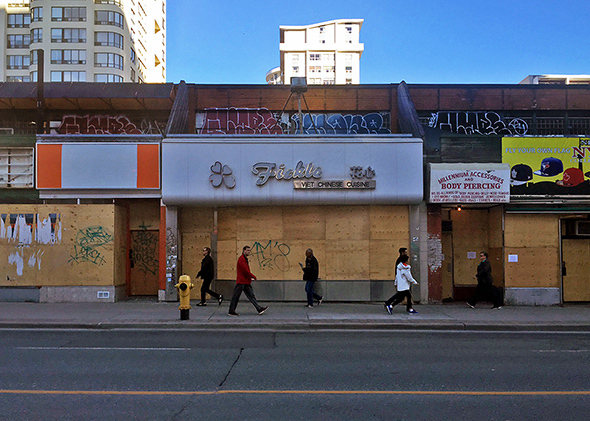 The mom and pop shops on Yonge St. all have an expiry date now. With two massive developments planned at Gerrard, Remington's isn't long for this world. Zanzibar will hold out longer, but it too will be consumed. Some developments are kind to street level retail and the heritage of this centuries old thoroughfare, but the head shops and indie restaurants (so long Papaya Hut) can't afford the increased rent, and so corporate blandness sets in even as the buildings are beautifully restored. Am I the only one who will miss the Kleen Air Shoes sign? Each major intersection from Bloor St. south to the Massey Tower project near Queen St. is in various stages of redevelopment along Yonge St.. But right now, it's the area just north of College that tells the story of the street. With one foot in the future and the other in the past, the state of things here is like an allegory for the whole city. We're growing up, but lots is being left behind.